Shane Dawson is a long time popular YouTuber. Shane and Greg were briefly friends. On December 12, 2009, Greg and Shane uploaded their collab videos to their channels. Shane recently had a surgery, so he could not make a video that week. He had Greg pretend to be a Shane Dawson impersonator for his video. (Source) Greg uploaded "SHANE DAWSON FANBOY LOVE! ", where he pretended to be an obsessed fanboy that paid Shane to make an appearance in his video. ($ource) This collab, along with a collab with SwiftKarateChop, helped Greg's subscriber rank skyrocket and put him on the map in the YouTube community of the time. Greg and Shane eventually became friends. Shane mimicking Greg in a 2015 video. Greg continues to Tweet about and mention Shane in videos, mostly in a negative manner. One example is before VidCon 2015, Greg became very vocal about how he believed VidCon is too dangerous for young fans because YouTubers could be sexual predators. Greg would show pictures of Shane hugging fans while explaining this on Twitter and in videos. Shane mostly ignores most of Greg's attacks and tweets. 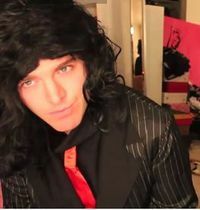 He will very rarely joke in videos about how much Onision hates him. His fanbase is very much aware of the beef between Shane and Greg and will joke about Onision in the comment section of Shane's videos.